The ion-exchanger is to use the exchangeable cation such as sodium ion and hydrogen ion in ion exchange resin to exchange with calcium ion and magnesium ion, thus reducing the content of calcium ion and magnesium ion. This process can be called water softening. The sodium ion exchanger that uses sodium ion as the exchange ion is sodium ion-exchanger. is CaCO3、MgCO3、CaSO4、BaSO4、SrSO4、SiO2 in high salinity water is larger than their equilibrium solubility constant, there will be some crystallization which will block up the water flow channel of membrane components. Therefore, before feed water enters into RO component, the water should be softened by sodium ion-exchanger, which is utilized to reduce calcium ion and magnesium ion in water. The sodium ion-exchanger make sodium ion in ion exchange resin to exchange with calcium ion and magnesium ion in water, effectively avoiding the formation of carbonate scale and sulfate scale. In this way, softened water is obtained. Sodium ion-exchanger should be equipped with regenerating unit. Because the regeneration cycle and softening effect are two key factors that ensure successful operation of reverse osmosis equipment. 1. A multistage centrifugal pump repeatedly provides saline water for ion exchanger. 2. Sodium ion in strong acid resin exchanges with scaling cation, and saturated resin solution can be regenerated by saline water. 3. Besides, sodium ion-exchanger is equipped with a salt dissolving tank of 500L in which industrial salt (non-iodized salt) is filled. Users should continue filling industrial salt until a little salt particle is separated out on the bottom of the box. 1. 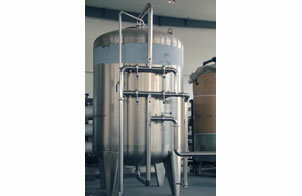 The device is a kind of stainless steel ion exchanger, whose diameter is 500 mm. Sodium ions in ion exchange resin of sodium ion-exchanger exchanges with calcium ion and magnesium ion in water, effectively avoiding the generation of carbonate scale and sulfate scale. Thus, users can obtain softened water. 2. The design current velocity is 15m/h. Founded in 2006, our company is a leading manufacturer and supplier of water treatment system in China. Here in Topling, we mainly offer water filling line, juice filling production line, carbonated drink filling line and related equipments including decapping machine (5 gallon bottle decapper), water treatment equipment ( water filtration sterilizers systems ), and other related machines. We offer installing and debugging services of our devices and staff training for factories abroad and OEM service. For more guides of sodium ion-exchanger or our other products, please contact us.